Born: 14th April 1886, Barton Regis, Gloucestershire. 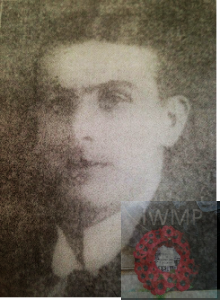 Died: 26th August 1917; age 31; KiA when going over the top he was targeted by a German sniper and shot at Peronne, France. 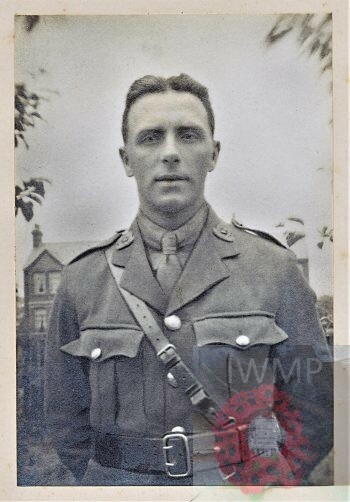 Relatives Notified & Address: Son of Francis & Emily Alderwick, of Bristol; husband of Florence A. Alderwick, of 4, Harcourt Road, Redland, Bristol. 1891 Alston House, 4, Villiers Road, St. George, Gloucester, Gloucestershire. Ernest was 5 years old and living with his parents, maternal uncle, and father’s ward. Francis Robert Alderwick, 32, an Assistant Superintendent – Provident Association of London, born Frampton Cotterell, Gloucestershire. Emily Mary B. Alderwick (nee Kethro), 30, born Bristol, Gloucestershire. Walter W. Kethro, 21, at a Sewing Machine Depot, born Bristol. Francis W. Garton, 17, a Moulder of Iron, born Bradford on Avon, Wiltshire. 1901 55, Woodborough Street, St. George, Bristol. Ernest was 14 years old, a Clerk – Accountant’s Office. He was living with his parents, brother, & father’s ward. Francis, 42, an Insurance Inspector. Francis Ralph Alderwick, 4, born Bristol. Francis Garton, 26, an Iron Moulder. 1911 857, Fishponds Road, Bristol. Ernest was 24 years old, a Clerk – Chocolate Manufacturer. He was married and Head of the Household. Eileen Mary Stevens Alderwick, born November 1910, Bristol. Trevor Ewart Stevens Alderwick, born February 1914, Ipswich. Noreen Nancy Stevens Alderwick, born June 1915, Ipswich. Soldiers’ Effects to Mrs. Florence Annie Alderwick – widow. 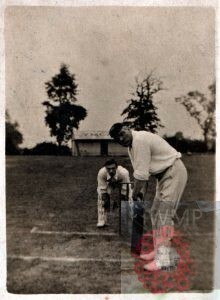 Ernest with his father batting. Ernest was an English cricketer who played as a right-handed batsman for Gloucestershire in 1908. Ernest made his debut as a lower-order batsman against Worcestershire, against whom he scored just seven runs in two innings, while his team went down to a 225-run defeat. 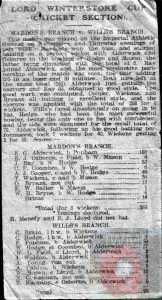 He played in the next game, three days after his first and against Northamptonshire but he scored a duck in his only innings before the match was abandoned for a draw. In 1914, he played a couple of Minor Counties games as an opening batsman for Suffolk. Ernest is also remembered on the war memorial at St. John the Baptist Church Ipswich.